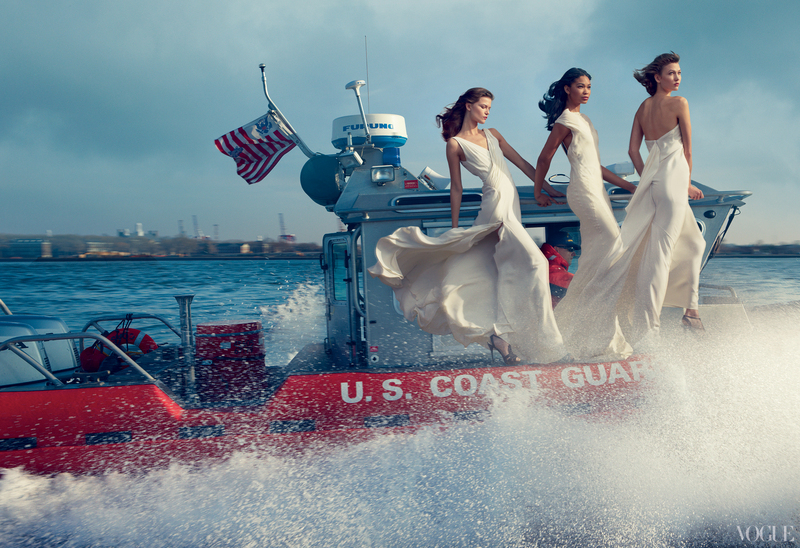 Amid the thousand-dollar dresses and stick-thin models, a Coast Guard small boat will grace the pages of next month’s issue of Vogue. The photo is part of a tribute in the February issue to rescue workers who cleaned up New York and New Jersey after Superstorm Sandy in October, according to fashion site Styleite. The models also took photos with the National Guard’s 69th Infantry, Con Ed workers, Bellevue Hospital staff, and members of the NYPD and FDNY. See all the shots here. The article on Styleite praises the shoot as conveying “the strength of the teams and magnitude of the event with grace,” unlike most “tone deaf” fashion magazines. What do you think? Is this a great way to pay tribute to the emergency personnel who worked around the clock after the disaster? What a fantastic way of promoting the hard work our rescue workers have to do year in year out. The picture itself is amazing and i bet that it goes viral as well.